Is there anything better than giving back during the holiday's? 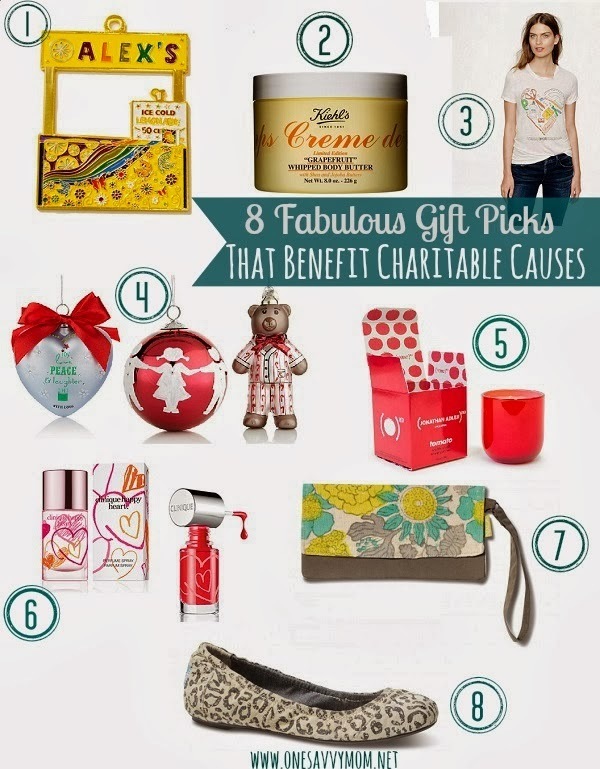 If your on a budget this holiday season and still want to give back in some way - we have rounded up some fabulous gift picks that benefit amazing charitable organizations with each sale. Consider it a "two for" - friends and family get a great gift and charitable organizations get a much needed donation to further their cause. 1. Alex's Lemonade Stand 2013 Holiday Ornament - Donate $100 to Alex's Lemonade Stand Foundation Holiday Campaign and receive this beautiful ornament, perfect for gifting! If you don't have $100 to donate this holiday - consider donating $50 to fund 1 hour of Child Cancer Research - that 60 minutes could lead to a cure! For every donation made, you can download a free printable holiday card to gift to those whose name you make the donation in. 2. Creme de Corps "Grapefruit Whipped Body Butter - Limited Edition ($38) - In the United States, 100% of the net profits (up to $100,000) of Limited Edition Creme De Corps Whipped Collection will support Share Our Strength No Kid Hungry Campaign to help end childhood hunger in America. 3. J. Crew Teach for America Linen T Shirt (available in men's, women's and children's sizing). 100% of the net proceeds from the sale of this tee will be donated to Teach For America, a nonprofit organization that trains and places recent college graduates and professionals in under-resourced communities nationwide to help ensure that all kids receive an excellent education. 4. Limited Edition Ornaments From HSN Cares: 100% of the net proceeds (no less than 30% of the purchase price) from the sale of each ornament goes to St. Jude Children's Research Hospital. 5. Jonathan Adler (Product) RED Special Edition Tomato Pop Candle ($38) - From November 24, 2014 continuing through 2014 each sale of this special edition candle can provide up to 10 days of life-saving medicine to someone living with HIV in sub-Saharan Africa. 6. Happy Heart Perfume ($38 - $10 from each sale goes to the Happy Hearts Fund) and Clinique Nail Enamel For Sensitive Skin (Happy Hearts Color) ($12.50 - $5 from each sale goes to the Happy Hearts Fund). The Happy Hearts Fund is a heartwarming organization that helps re-build schools - and restore hope- in places affected by natural disasters. Founded in 2005 by model and philanthropist Petra Nemcova, it's mission is to bridge the gap between first response and recovery. 7. JOYN Spring Flora Wristlet ($24)- With every product that you purchase, you are helping JOYN provide employment, educational opportunities and medical care to artisans in the Himalayas. 8.Toms Brown Gisele Ballet Flats ($84) - With every purchase Toms will help a person in need through their One For One Movement. For every pair of shoes purchased, Toms provides a pair of shoes to a person in need in developing countries around the World. Toms is also helping to restore sight to those in need - for every 1 pair of Toms Glasses sold (coming in 2014), they will provide glasses, sight saving surgery or medical treatment to one person in need - find out more by CLICKING HERE.